Opel hopes its new model, the Adam, will help to reverse the company's 14-year-long long history of losses in the European marketplace. 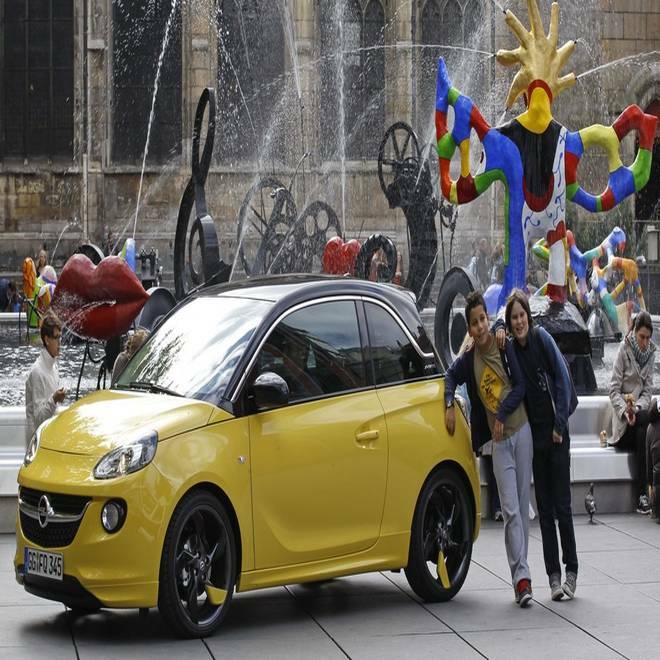 Despite its miniscule size, the new Opel Adam will make a big splash when it debuts at the Paris Motor Show this week. Named for the German automaker's original founder, Adam Opel, the three-door auto is the first in a wave of 23 new models the manufacturer plans to bring to market during the next four years — a product assault parent General Motors can only hope will reverse what is now Opel’s 14th year of sinking deep into the red. But Opel isn’t the only European automaker in trouble. France’s Peugeot is expected to seek a bailout from the French government. Senior officials at Italy’s Fiat — partner to Detroit-based Chrysler — last weekend met with that country’s top government officials to discuss “strategic options.” And even Daimler AG has cut its earnings forecast and downsized production plans for the rest of the year, warning that the situation in Europe is spiraling downward faster than expected. The European Automobile Manufacturers Association, or ACEA using its French initials, expects 2012 to bring the market’s worst sales in 17 years. Industrywide, car registrations dipped 8.5 percent for August. And only Volkswagen, among major manufacturers, posted a sales gain — largely by including Porsche results in its corporate numbers. Sales have been plunging in the southern European markets hardest hit by the Continent’s economic slump, notably Italy and Spain. But even the economic powerhouse is sliding downward, with ACEA reporting that German registrations dropped 4.7 percent last month. Compared to the U.S. automotive slump of 2008 and 2009, Europe actually isn’t faring so badly. The American market fell from a peak of more than 17 million vehicles in the previous decade to barely 10 million by the time it bottomed out. But there’s a big difference, analysts and industry leaders stress. In the U.S., the industry moved aggressively to respond, largely through factory closings and job cuts. General Motors and Chrysler, in particular, emerged from their own 2009 bankruptcies collectively shuttering a score of assembly and component plants. By comparison, relatively little has been done in Europe other than sound the alarm. Even before the sovereign debt crisis began, Europe was laden with overcapacity. By some estimates it now has at least eight more assembly plants than are needed. Fiat did shutter one grossly underutilized facility on Sicily, but other makers are so far only discussing their options. Part of the problem, Marchionne and others complain, is that German manufacturers have resisted calls for a unified response to the European automotive crisis, especially Volkswagen, which has managed to sidestep the worst of the situation — and which has declared its intent to become one of the world’s largest, if not the top-selling, automakers before the end of the decade's. But as the situation worsens, some other automakers are being forced to act even if there are dangers associated with moving unilaterally. Opel is arguably the most troubled of the European marques with various analysts forecasting that losses for the year will come to between $1.5 billion and $2 billion. Morgan Stanley’s influential analyst Adam Jonas last month issued a report arguing that, "We believe the time has come for GM to find a new home for Opel." For its part, GM continues to put together a rescue plan, one that will see both the addition of new products and the contraction of production and manpower. But the latter goal is limited by both government regulations and union contracts making it extremely difficult to reduce capacity. GM Vice Chairman Steve Girsky has won some minor concessions from the normally militant union IG Metall, however, by sharing internal data on the crisis but even then, the union will permit the closing of just one plant — and only in 2014. Peugeot is also pushing to close a plant, though the French government is warning that such a move might forestall any aid to the fast-sinking maker. “The pain needs to be evenly distributed across Europe,” said Marchionne, and a number of manufacturers are now calling for the creation of an automotive czar — not unlike the one who oversaw the GM and Chrysler defaults — to bring everyone to the table. But, so far, that idea has gained little traction on the government side. And so, for the moment, automakers are frantically searching for individual solutions while unions are looking for ways to minimize the impact on their members and national governments continue to drag their feet. The biennial Paris Motor Show, which begins with two days of press previews today, could thus be critical to everyone. The new Opel Adam will be just one of at least 50 to 60 new products planned for introduction at what is formally known as the Mondial de l’Automobile. In more normal times, auto shows have a tendency to excite motorists and spur them to head for showrooms. But whether that will happen this year is uncertain. Shoring up the European economy remains a work in progress, at best, and it’s uncertain new sheet metal can offset the impact of the ongoing negative headlines.